Postal Connections provides a speedy and efficient fax service to businesses and residents of Vancouver. It’s part of our office suite of services that include packing, document printing, shipping, mailbox rentals and office supplies. We use the latest, high-speed, quality fax machines and our own phone line to ensure your faxes arrive when needed. Give our fax number (360) 546-2603 to your business associates, family and friends. Put it on your website and business cards. Ask anyone faxing you to include your name, local contact number or email on the cover sheet. 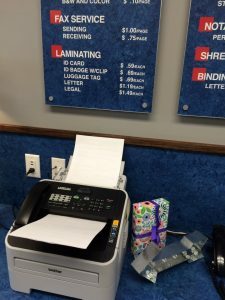 We’ll notify you the minute a fax comes in for you!